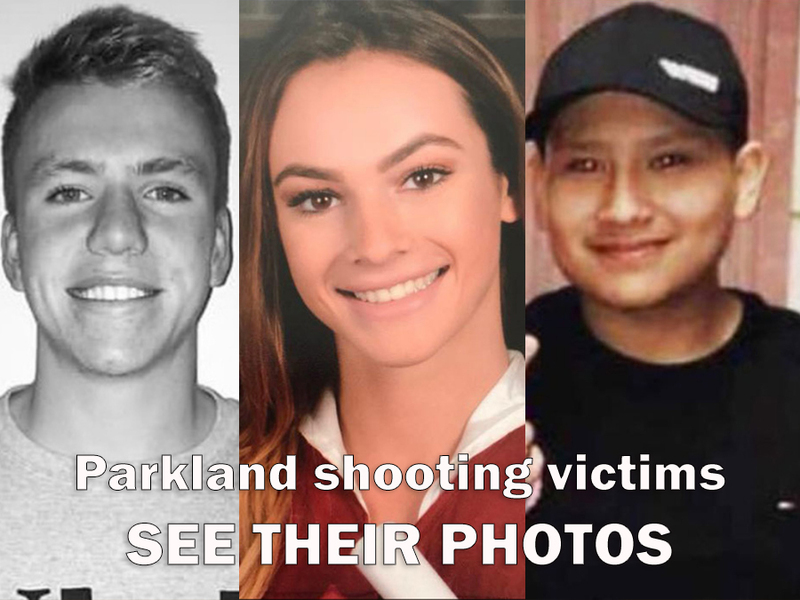 Seventeen people lost their lives at Marjory Stoneman Douglas High School during the school shooting on Feb. 14. These are their names. Broward Sheriff Scott Israel released the names of the victims Thursday afternoon. This story will be updated as more information becomes available. Alyssa Alhadeff , 15-year-old freshman. She is remembered by her friends and family as being a talented soccer player, smart, and having an amazing personality. Information about Alhadeff's funeral can be found here . Scott Beigel , 35-year-old geography teacher. He reportedly was shot while opening his classroom door to let students inside. He was shot, students say, while trying to lock the door to his classroom to keep the shooter outside. A student said he successfully locked the door and likely saved students in that classroom. Martin Duque , 14-year-old freshman. "Words cannot describe my pain. I love my bother Martin you'll be missed buddy. I know you're in a better place," Miguel Dugue, Martin's brother, posted on Instagram. Nicholas Dworet , 17-year-old senior, swimmer. He planned to swim for the University of Indianapolis, according to Facebook posts. In a statement, UIndy swimming coach Jason Hite called Dworet an "energetic and very vibrant kind" who cheered for his soon-to-be university during a swimming meet last month. Aaron Feis , 37-year-old assistant football coach and security guard. He is hailed as a hero after shielding students from gunfire . Coach Feis leaves behind his wife Melissa and their daughter Arielle, according to his bio. Jamie Guttenburg 14-year-old freshman. "My heart is broken," her father Fred Guttenberg posted on Facebook. She was a dancer at Dance Theater in Coconut Creek. Dancers are asked to wear orange ribbons for her at upcoming competitions. Luke Hoyer , 15-year-old freshman. He loved basketball and eating McDonald’s Chicken McNuggets and macaroni and cheese, his aunt told PEOPLE Magazine. Chris Hixon , 49-year-old athletic director. Hixon belonged to a Roman Catholic church in Hollywood. The Archdiocese of Miami confirmed his death Thursday. When a volleyball team needed a fill-in coach, Hixon took over; the same thing happened with the wrestling team, Sanzari said. And when the school needed someone to patrol the campus and monitor threats as a security specialist, Hixon did that, too, our news partner NBC6 reported. Cara Loughran , 14, loved the beach and spending time with her cousins. Gina Montalto , 14, friends said she was a member of winter guard. Members of the athletic community posted this week's regional performance is dedicated to the Stoneman Douglas Winter Guard family and Gina. "We love you and miss you. We will max it out for you. You'll always be in my heart," one post said. Joaquin Oliver , 17 years old. Oliver was born in Venezuela and moved to the U.S. when he was three, according to Miami Herald. Alaina Petty , 14 years old. "Alaina was a vibrant and determined young woman, loved by all who knew her. Alaina loved to serve. She served her community through her participation in the Marjory Stoneman Douglas JROTC program and her countless hours of service as a volunteer for the “Helping Hands” program of the Church of Jesus Christ of Latter-day Saints. Alaina was part of hundreds of volunteers that rushed to the most heavily impacted areas of Florida to clean up and help rebuild the lives of those devastated by Hurricane Irma. Her selfless service brought peace and joy to those that had lost everything during the storm," Petty's family said in an official statement. Meadow Pollack , 18-year-old senior. She was looking forward to her senior prom, graduating in June, and going on to Lynn University in the Fall. She was a beautiful, warm, loving and intelligent soul whose sense of humor and loyalty to friends made her beloved by all who knew her, friends posted about her. Pollack's family and friends have set up a GoFundMe account to raise money towards her funeral arrangements and a memorial fund in her name. Helena Ramsey , 17, friends described her as smart, kind-hearted, and a thoughtful person. She was deeply loved and loved others even more so. Alex Schachter , 14. "He was a sweetheart of a kid! As a freshman, Alex loved the marching band and played the trombone and baritone as part of the Eagle Regiment band - one of the top marching bands in the state of Florida! He is survived by his heartbroken parents, three siblings, grandparents and countless cousins, aunts, uncles and friends," family posted in a GoFundMe account set up to raise funds for a scholarship to help other students experience the joys of music, as well as fund, increased security at schools. Carmen Schentrup , 16, community groups posted that she was a semi-finalist for a national merit scholarship. Peter Wang , 15-year-old freshman. He was an ROTC and wasn't interested in status but wanted to help others, relatives said.